My parents are both Hock Chews, so that makes me a Hock Chew too. Dad comes from Sitiawan, while my mum’s from Maran, a small town in Pahang. Dong Mee Hong is my favourite place to eat in Maran. In Sitiawan, we normally go to Bei King (mum’s cousin’s shop). This was what we had for grandpa’s (mum’s dad) 76th birthday. This is the red wine mee suah, usually eaten on birthdays. 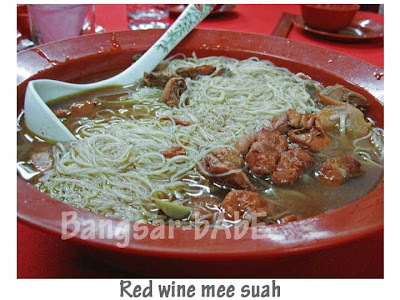 I love the gingery wine taste of the soup, together with the silky smooth, “al-dente” mee suah. I had two bowls of this. 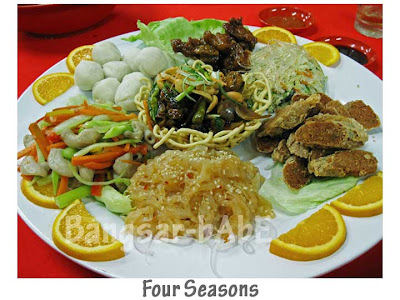 =D The four seasons dish was not bad. Most of them are self-made, not bought. I especially enjoyed the fried lobak. The lady who cooked all the dishes is my mum’s distant aunt (grandpa’s cousin). 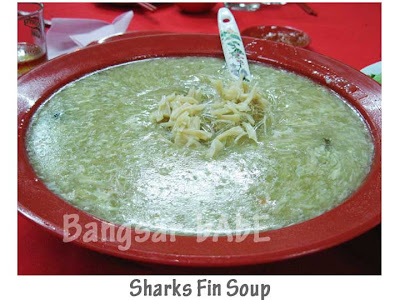 I shamelessly had two servings of sharks fin soup, because my uncle didn’t want his. 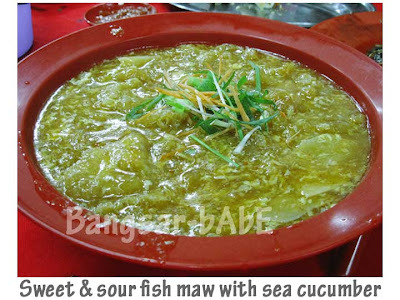 Thick, hearty and full of flaky crab meat, I had mine with a generous dash of black vinegar. Not sure if they used real sharks fin in it though. 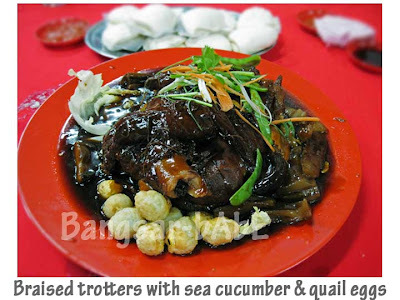 Next up was the braised pig trotters with steamed man taus. Braised to perfection, the meat was fork tender and delicious. The leftovers were used to make “chap chai” the next day. 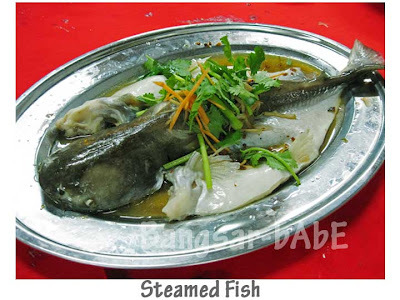 I’m not a fan of steamed fish, so I usually skip the round. According to my parents, the fish was very fresh. Everyone on the table enjoyed it. Now this is the one dish I never miss, ever! It is my favourite dish, and everyone knows it. 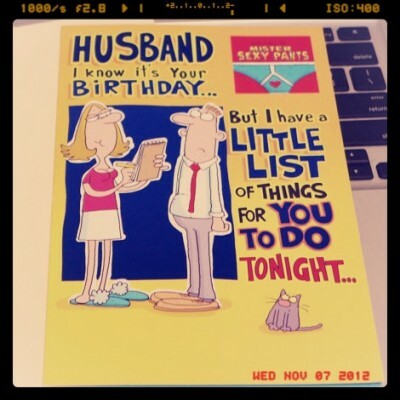 My mum does it best, and this one comes in a close second. 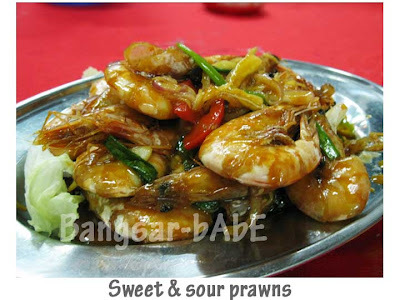 This version is spicier and more sour, whereas mum’s version is sweeter and heartier. It’s so good that I’m reluctant to share some with rif when he comes over. *blush* I didn’t bother with the prawns as I don’t like getting my hands dirty. rif usually peels them for me when we eat out. Sis said they were succulent and yummy. The broccoli with abalone slices and mushrooms were pretty tasty. 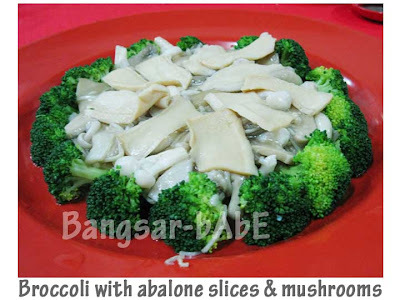 Tender abalone slices, fleshy oyster mushrooms and lightly blanched broccoli in light sauce. I think my mum enjoyed this a lot. 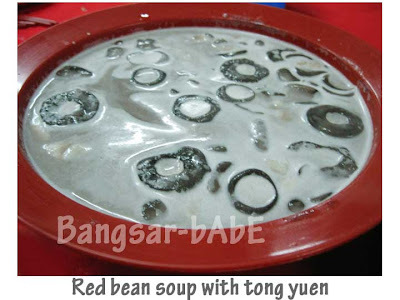 Dessert was red bean soup with glutinous rice balls (tong yuen). I didn’t care much for it as I like my red bean soup piping hot. Dinner was very satisfying. I haven’t had a full course Hock Chew dinner in almost a year! hi, i was searching around in google for hock chews. i was doing this because apparently, a fren told me my name, Ken Yang, is a unpleasant word in Hock Chew. is that true? if yes, could u englighten me the meaning pls? Ken Yang – Hi Ken, I wouldn't say your name is an unpleasant word in Hock Chew. "Ken Yang" means "dog" in the Hock Chew dialect.